Teddy Bears Picnic! 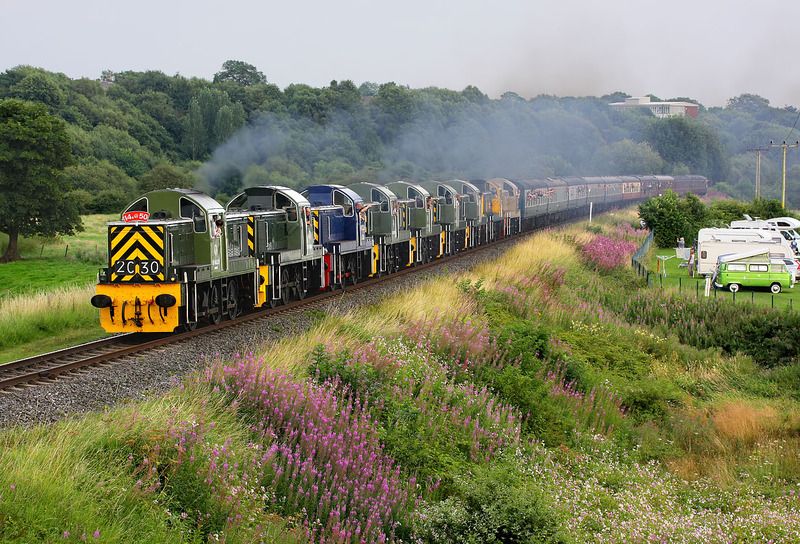 With a fanfare of horns, D9531, D9520, D9513, D9555, D9521, D9526, D9539, 14901 & D9537 storm past Burrs on 26 July 2014 with the 1Z01 19:00 Bury to Rawtenstall service, during the East Lancashire Railway's Class 14 Gala. This is definitely the wackiest special train I have ever photographed, but it was certainly worth the trip to Lancashire just for this one shot. The sound was awesome, and the vibration could actually be felt! It had been hoped to have ten locomotives on this train, but maroon liveried D9523 had failed, and so this evening 'Beerex' had to make do with 'just' nine locos. That is still 5850hp, albeit limited to 40mph. A fitting 50th anniversary tribute to these often overlooked locomotives. There is even a contemporary Volkswagen camper van in the picture!